The Right Whale Research team has been documenting and analyzing fishing gear entanglements and the subsequent effects on health for years. By better understanding how entanglements occur and the serious consequences they have on the population, we can make recommendations for measures that help reduce the risk of entanglement. 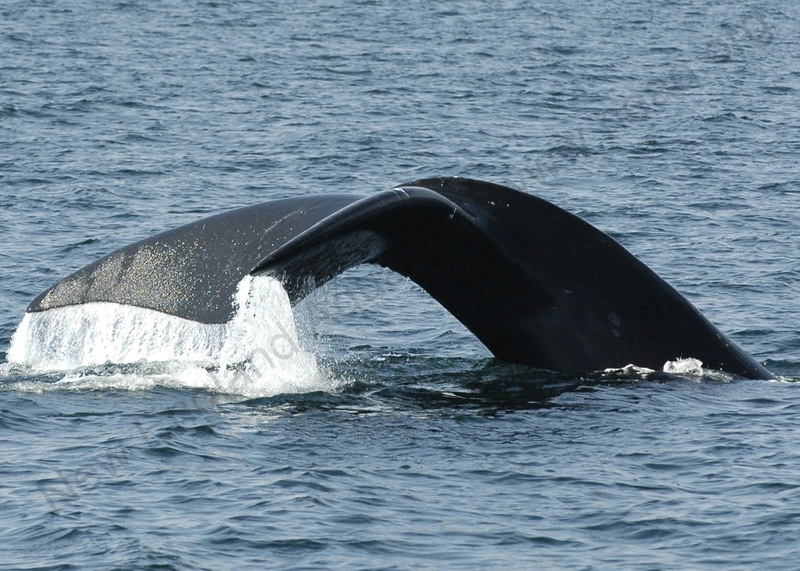 We hope you will support our work by sponsoring a right whale or making a donation to our program. On September 24th, two eager crews headed into the Bay of Fundy on the R/V Nereid and R/V Callisto. The last survey we attempted was September 21, but we didn't make it very far before turning back due to strong winds and rough seas. As the Nereid motored along our tracklines, we saw many fin whales (our grand total for the day was 12!) and sighted our first right whale, Catalog #2201, just before 11 AM. An hour and a half later, we came across our second right whale for the day. From a distance, we noticed the color orange on the whale... seeing any color other than black for body, white for cyamids, or brown for mud on a right whale always makes your heart beat a bit faster with concern. 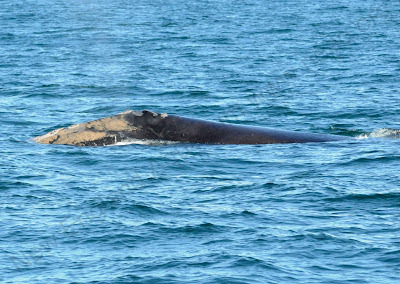 As we got closer, our worry was justified- this whale had lots of raw scars on its peduncle and flukes that were covered with orange cyamids. Orange cyamids appear on healthy newborn calves, but if they are copious on an adult, it's likely because the individual is in poor health or is carrying open flesh wounds. The wounds on this whale were consistent with those caused by an entanglement in fishing gear with linear wrapping cuts caused by rope. Presenting a dip in the back right behind the blowholes, it was also visibly thinner than a normal, healthy looking animal. With choppy seas, it was difficult to get a good look at who this whale could be. Adding to the challenge of matching this whale, this individual had a new scar and heavy cyamid coverage on its head, making the callosity look a little different than normal. This year, our team has been experimenting with a brand new tool: the E-Catalog. The E-Catalog is an exported version of our photo-id database, downloaded as a (very large) file onto a laptop computer that researchers can take with them into the field to help them match individuals in real time. The E-Catalog was programmed by Parallax Consulting, LLC, with funds from NOAA's Northeast Fisheries Science Center, and leverages the programming architecture of DIGITS- our matching and data processing software. This is slightly different than the paper Catalog that we normally take with us on the boat, which allows researchers to look up head codes and see composite drawings of individuals. Now with the E-Catalog, we can still search for individuals by using head codes, but we can also input any other features that can help narrow down the search, such as the size of the lip callosities or any identifying scars on the head, body or flukes. In addition to showing the composite drawing, the database also shows select photographs of the whale (called "primary" images, they are the best representative images available, chosen by our team). 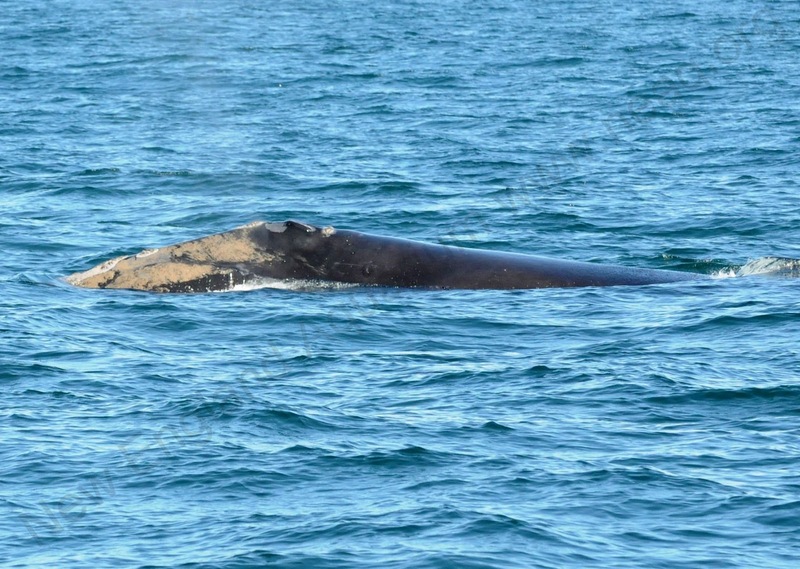 The E-Catalog is intended to help speed up the process of matching whales in the field, which is especially important if a whale is entangled, injured or sick. Quick matching is also handy for when we need to know if a biopsy sample needs to be collected from a whale before it swims out of sight! Philip Hamilton uses the E-Catalog to match a whale while in the field. After trying a few different combinations of head codes with the E-Catalog and comparing the photographs we just took with the primary images, we discovered who this whale was: Catalog #3610. This whale was first observed in January 2006 and is of unknown age. Unfortunately, this is not the first time #3610 has been entangled. First seen carrying gear in September 2006 in the Bay of Fundy, this whale traveled all the way down to the Southeast U.S. where it was seen in January 2007. Much effort was made by several teams to follow the whale, and a disentanglement team made of several members of the Atlantic Large Whale Disentanglement Network worked to make some cuts in the gear and remove as much of it as possible. In April 2007, #3610 was seen again and confirmed to be free of all gear. After healing from its 2006 entanglement, #3610 had minor scars on the peduncle and flukes. The last time #3610 was seen by any observer (that we know of so far) was March 28, 2012 in Massachusetts Bay by the Provincetown Center for Coastal Studies. At that time, the whale did not have any new peduncle scars and was not carrying any fishing gear on its body, so we have some time-frame of when this entanglement occurred. Due to the match, we were able to tell that this whale needed to be biopsy darted. #3610 was difficult to follow because it didn't stay at the surface long and would sometimes travel east, and sometimes north. Deciding that we didn't want to stress the whale any more than needed, we stuck with it for one last surfacing. Even though we had estimated where it would come up fairly well, we were still too distant to collect a sample, and we allowed the whale to continue on its journey into the Bay. Moira Brown on the bow, ready to biopsy dart #3610. The good news is that this whale did not appear to be carrying any gear, and now that it is free from whatever was entangling it, it can start to recover. Hopefully, it will be photographed by other research teams over the next several months, which will allow us to study and track the healing process. If we see this individual in the Bay of Fundy next summer, we hope to find it looking fat and with well-healed scars. 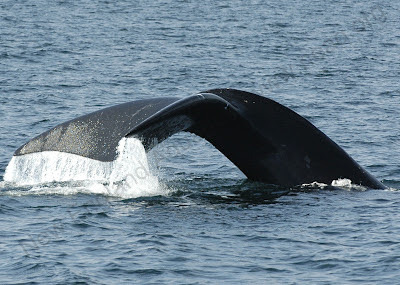 We finished out our day with one more right whale sighting around 5 PM- Catalog #3192. The Callisto had a successful day for the season, photographing five individuals. Between the two vessels, we had one duplicate whale, which brought our total to seven unique whales for the day- not a bad tally for our last day on the water of this interesting field season! I love this post because we can get some useful information from your blog. I expect more post from you guys.